You’d be forgiven for checking the year to make sure it was 2018 not 2008 yesterday at GMHBA Stadium. The reason for the confusion was the performance of the Cat wearing number 3 in the wet conditions and the one wearing number 44 down back who repelled Saints forward entries over and over again. No it wasn’t Jimmy Bartel and Corey Enright making surprise comebacks it was the heirs to their jumpers, Brandan Parfitt and Tom Stewart. Both emerging Cats were a part of last year’s draft crop and both have started 2018 in fine form. Sunday was by and far Parfitt’s best game for the club, admittedly from a small sample size of just 19 games. Whilst he registered career highs in disposals, marks, goals, tackles, inside 50s, clearances and AFL Fantasy it was his intent and pressure around the contest that really stood out especially in the first half. His finishing is elite and whilst he isn’t breaking land speed records, he has that uncanny knack like Bartel of looking like he is always in the right spot at the right time. Stewart’s incredible start to the season (he’s registered career highs for disposals, marks and rebound 50s) has been overlooked with the focus instead on who is missing from the Cats backline. Stewart is currently ranked fifth in the AFL for rebounds from 50 alongside All Australians Heath Shaw, Michael Hurley, Rory Laird and Kade Simpson. With his taller backline teammates going down with injury, Stewart has lifted again from his debut season to potentially be leading the Cats best and fairest at this early stage. 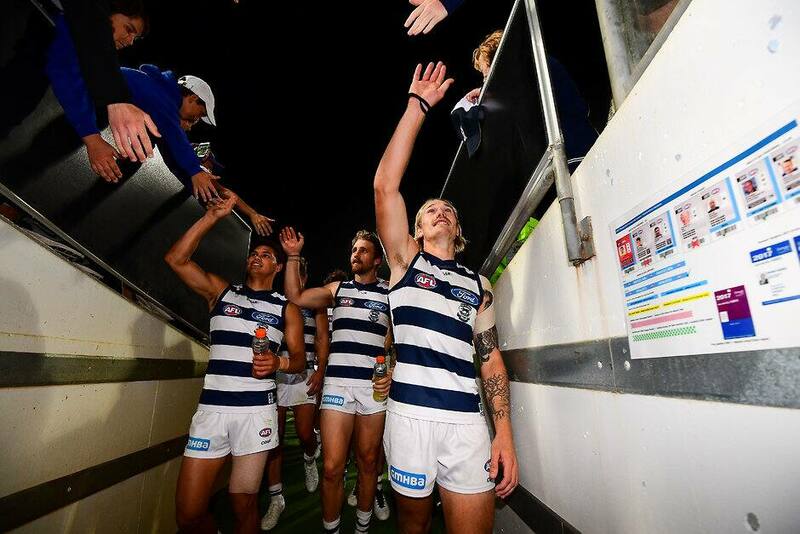 Kids across are Geelong are already drawing Sharpie tattoos on, growing their hair and diving through the air fist poised for a spoil with the number 44 proudly on their back. Both these players are driven, loyal and proud. They won’t be resting on the back of a couple of good games, they’ll be doing all they can to get their side across the line in Adelaide.